Largeholidayhouse.com features group accommodation ideas, activities and events and promotes over 2,500 self-catering cottages / holiday houses across England Scotland and Wales. These holiday homes range from Country mansions, Scottish crofts, shooting lodges to modern city warehouse conversions, some are well placed for family entertainment - others for sporting pursuits or location specific activities. The properties advertised are managed by an agency that offers a very large selection of holiday homes. Choose a cottage in a part of UK that you wish to visit, select the number of guests and the dates you wish to travel and we hope you will find a perfect place to stay! The agent used may change from time to time The Business Principal will always be displayed on the page of booking - and on your rental agreement and is with whom your rental contract will stand. You can contact the Agent Directly at any point of your booking. 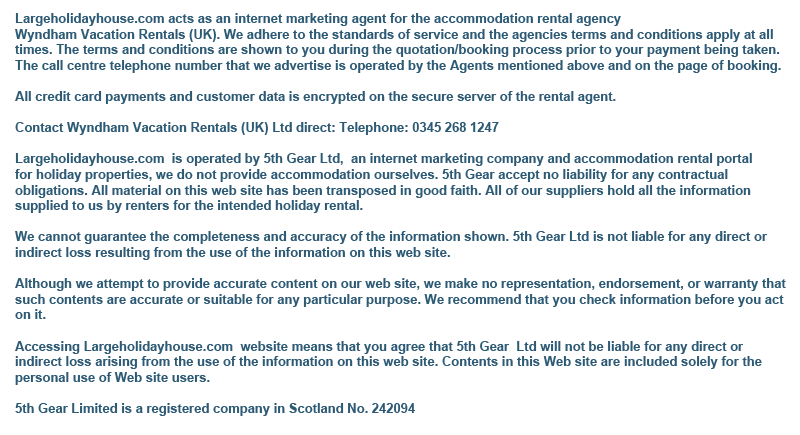 The terms and conditions of each rental are shown to you during the quotation/booking process on the rental agency's website, prior to your payment being taken. The call centre number that we advertise is operated by the rental agency mentioned above and on the page of booking. Outstanding large holiday house in Highlands near Kingussie with 6 bedroom, sleeps 12, No pets, Pub within 1 mile, Wifi, Cot Available, All En-suite, Private Hot Tub. Large holiday house in Devon near Totnes with 8 bedroom, sleeps 20, No pets, Barbecue, Wifi, Cot Available. Big house for a holiday in Pembrokeshire near Saundersfoot with 6 bedroom, sleeps 12, No pets, Barbecue, Ground Floor Facilities, Golf nearby, Wifi, Cot Available, Coastal Property, Private Hot Tub.